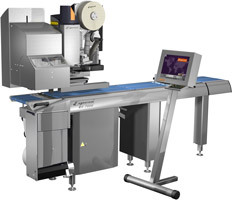 This fully automatic C-Label system is individually combineable with the ESPERA price labeller series 7000. Due to it´s compatibility it increases the number of application within the production by the field of C-Labels. Upgrade your product portfolio with C-Label solutions and the compact C-Labelling system at highest speed.